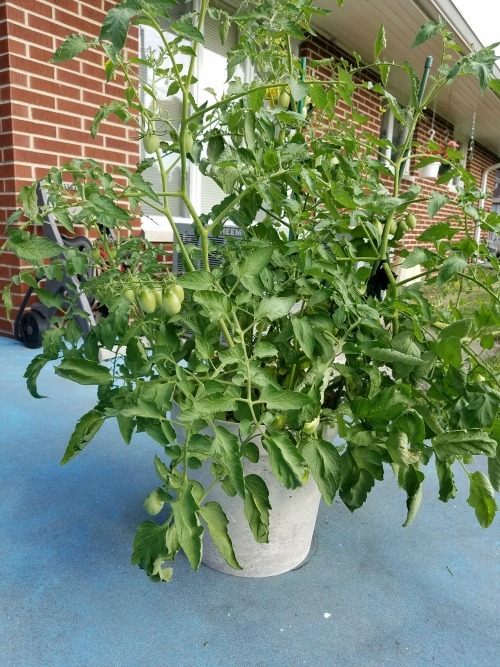 Last year, for the first time, I decided to try growing a tomato plant. I got plates full of tomatoes, and they were delicious. Just enough for our household. Just enough to encourage me to try again. So fast forward a year. I bought the same type of tomato (Roma, also known as an Italian tomato). I fertilized it the same way with Epsom Salt. Watered it on schedule. Even placed it in the same sunny location as before. So you’d expect similar results, right? Sad, isn’t it? I blame the weather — too hot and too rainy at the wrong times. All out of my control. On the plus side, I avoided hornworms and blossom end rot, two threats to Romas, but where did the leaves go? And why is the fruit congregated at the top of the plant? Yes, I’ve harvested tomatoes, and they’ve been pretty good. Small and few in number though. Certainly nothing to share with the neighbors. This entry was posted in Seasonal and tagged gardening, harvesting, Roma, tomato, weather. Bookmark the permalink. That’s so true, Beth Ann. Both my grandpas were farmers, and I can still “see” one of them looking out over his pecan orchard with tears after a hurricane blew through. They really must have the patience of Job to choose that as a profession! That’s the oddest thing I’ve ever seen. I don’t know much at all about veggie gardening, and what I do know about tomatoes is that too much rain will make the fruit split and be watery. I’ve often seen plants loaded with tomatoes but almost leafless, too. I’ll be interested to see if others know what might be up with your plant. Better to have tomatoes and no leaves than leaves with no tomatoes, I suppose! Good point, Linda! I don’t know what I did “wrong,” either, but I’m open to everybody’s thoughts and suggestions. Perhaps it was Beginner’s Luck that my first tomato did so well (and looked so pretty while doing it). I browsed through my photos and found several of this year’s offering in which the leaves looked healthy and the tomatoes full and green. Something happened, that’s for sure. I wonder if the same thing happened to it that happened to my crepe myrtles (blowing herbicide from the neighbors??). I’ll probably never know. Sigh. I’m glad you got a kick out of it! The good thing is it’s still producing tomatoes, and they taste just fine. Also, for some strange reason, it’s starting to put out healthy leaves toward its top. Go figure! I’m hoping it will recover eventually, but you’re right. Some days, I look at it and feel just as weary as it looks, ha! Debbie, I think I remember you sharing that first photograph of the thriving tomato plant last year if I’m not mistaken. Roma tomatoes are my favorite. I love to toss them into salads because they’re the perfect size to just pop into your mouth. I love to mix them with cucumbers and some fresh basil. YUM-MY! This summer has been so hot, so humid, and very rainy. So you’re right, it’s out of your control. However, you are still a SO MUCH MORE gifted gardener than I. I have a black thumb when it comes to growing things. Heck, I even kill silk flowers – HA! Have a faaaaaaaaaabulous week, my friend! Ron, your memory is spot on! I was elated last year when my beginning efforts at tomato-growing produced this lovely plant. 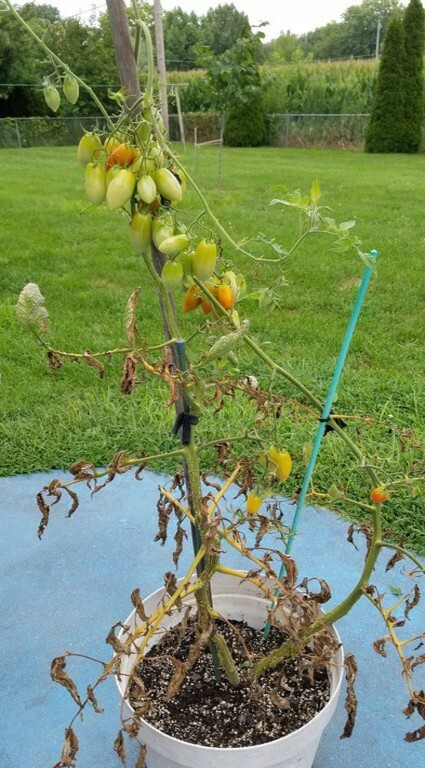 And here it is a year later, and my poor tomato is riding the Struggle Bus! maybe you got attacked by a tomato worm? You think? Gee, I haven’t seen any. Maybe they’re masters of disguise. Ninjas! Red ninjas are the best. Gardening highs and lows. I can relate. Those tomatoes are worth the effort, I’m sure. For some odd reason, this plant is beginning to make leaves again, only at the top. I’m baffled! I never heard of using Epsom salt. I have to tell my dad. He had his best tomatoes this year. He planted them in a different spot. The rain here in the northeast helped too. He used miracle grow this year. Try again next year Deb. I think it IS all about the weather. We didn’t plant anything this year, because we were gone all of June and half of July. But the year before we had dismal tomatoes…so we’re hoping the break for one year helps the soil and we too look forward to next year. We had a miserable winter, followed by a too-wet spring. Summer has been blazing hot. No wonder my plants were unhappy. Good luck with yours next season, Dawn! © Copyright, 2010-2018. Debbie Pierce (AKA Domermom). Please don’t lift, copy, or steal these blogs, or any part thereof, without my permission. This includes photographs! To me that I am there. Fill my mind and touch my heart.